On the occasion of the 136th birthday of Donald A. Kennicott, the long-time editor of Blue Book magazine, I'm happy to present to you this article written by him in the November 1954 issue of Blue Book magazine, 2 years after he had stopped editing the magazine. It's a great companion to Mike Ashley's article about Blue Book which covers the magazine during Kennicott's tenure. The gentleman and scholar who was a Bluebook editor during 42 of this magazine's 50 years looks back on an exciting and distinguished career. After a long experience in magazine editing, Burgess Johnson wrote an autobiography which he called “As Much as I Dare, ” taking his title from Montaigne: “I speak the truth, not so much as I would, but as much as I dare; and I dare a little more as I grow older. ” Ellery Sedgwick, recalling his 30 years of “adventuring in human nature” as editor of the Atlantic, chose “The Happy Profession” as the title for a memoir of those years. After my 42 years with Bluebook, I am inclined to think that Burgess Johnson chose the better title. He has to worry about circulation—keeping what readers he has, and getting more. He has to worry about errors in his magazine—and remembering that even a misplaced comma can reverse the meaning of a sentence, there are close to half a million facts in each and every issue that must be correct. (Standard illustrations of misplaced commas: “Senator Smith, said General Jones, is a fool.” Drop out the commas, and you have: “Senator Smith said General Jones is a fool.” —and perhaps a lawsuit on your hands. Or consider the law once passed in a Western state: ’ “It shall be unlawful for any hotel, dining-room or kitchen to be used for sleeping purposes. ” The law had to be repealed and passed over again to correct the confusing comma the printer had dropped in after the word “hotel.”) He has to worry about libel suits, “invasion of privacy” and possible copyright infringements. He has to worry about plagiarism. He has to worry about keeping to the rigid time schedule which a magazine printer has to require—and a sudden illness or a lost weekend on the part of an author or illustrator can make that very difficult. Moreover, if an editor is worth his salt, he does not forget his responsibility, especially in wartime, to the national interest, nor his responsibility for the influence which even a magazine story may have upon the character and conduct of a reader. Moreover, an editor has to hurt a lot of people. Out of a hundred manuscripts offered, he may be able to buy one or two. Most authors of the 90-odd scripts declined will accept their disappointment philosophically in the knowledge that it is part of the business. But it hurts just the same, for a story is a very personal thing to its author, and repeated rejections cause a few of them to cherish a resentment that seems to rankle. Indeed, I have often surmised that the underlying motive of plagiarists—people who attempt to sell a story stolen from another magazine or a book— is a desire to “get even” with an editor who has failed to appreciate them. When I reached the statutory retirement age, I had many kind letters from friends, lots of them mail-order friends whom I cherish nearly as much as first-hand acquaintances. My immediate successor also had letters of congratulation, some of them from people unknown to him or me. One of these, which he showed to me, extended best wishes, and added that there were two men in this country who in his opinion rated a good stiff punch in the teeth: one of them was Phil Wylie, and the other was Don Kennicott. I don't know the source of his grievance against Phil Wylie, or against me. I can only guess that he was one of those people whom I had had repeatedly to disappoint. And Wylie has been an editor too. A writers' club in the West once came up with what seemed to them a bright idea, and wrote to me and other magazine editors requesting that instead of using the customary printed slip with a returned manuscript, we enclose a card with half a dozen reasons for rejections printed thereon, and the one applicable in each case checked. I told them that this could easily be misleading, for many good stories that achieve publication break half the rules in the book. The fact is that the basic reason for many rejections lies in the character of the writer, for anyone who writes for publication goes to confession. Yet it would be a far worse and wanton wounding of feelings if we were to return a manuscript saying that this story seems to us to have been written by a stupid person, or a wrong-headed person, or a person who hasn't grown up yet. Of course in the case of a story that showed real promise, we always sent a note rather than a printed slip; yet daily an editor has to hurt some people, often people who are his friends, or people trying to raise money because they are in some dire trouble. As I look back from my retirement lair in the Connecticut Berkshires on my 42 years with Blue- book in Chicago and New York, the great change in our magazines, mostly—but not wholly—for the better, is striking. When I came on the job in that grubby little office in that grubby little building in Chicago in 1910, Karl Harriman, one girl secretary and I got out three magazines: Red Book, Blue Book and Green Book. (The names were later telescoped into single words). 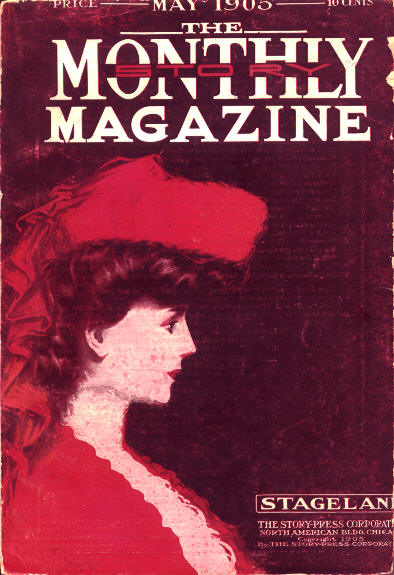 Red Book was an illustrated magazine printed on smooth paper, and composed entirely of short stories except for a theatrical article. Blue Book also had a section devoted to the theater, printed on enameled paper, illustrated with scenes supplied by the press agents, from the new plays, and filled in with synopses of the new plays, which I wrote (with many errors, doubtless) from the New York critics' reviews. The bulk of the magazine was made up of newsprint paper, and contained short stories piled one after the other without illustrations except for “stock” headings—that is, if a story dealt with the sea, one used heading #47, the picture of a ship, and so on. 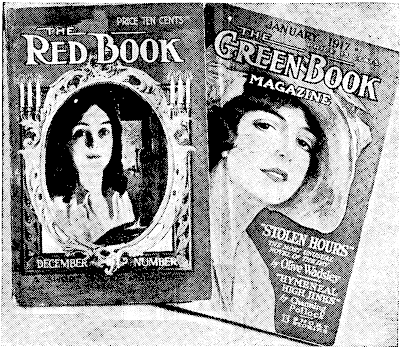 Green Book was devoted entirely to the theater, and included in its contents a long “novelized” version of some successful new play. Red Book is still in print as of 2017!! !, very different now of course. Karl's preparation for editorial work had been the University of Michigan, some newspaper experience, a published novel, and a job as advance agent for a circus—this last a real asset, for it gave him a valuable sense of showmanship. My preparation had been a degree from the University of Chicago, four years' pioneering in New Mexico when it was still a Territory, and some free-lance fiction-writing. I had sold 30 or 40 stories, and the two or three I had sold to Red Book and Blue- book gave me my introduction to that office. Karl and I had to work hard and fast six days a week. Karl bought all the material; I read all the copy and all the proof. By modern standards the magazines we got out were not very good, and yet competition was so weak that we got by. By competition, I do not mean the rivalry of other magazines, for there were some very good ones, but the competition of other interests. There were of course no radio or television; moving pictures were primitive, and there were few automobiles. It is true that most people had less leisure than they have nowadays, but they had far fewer amusements, and magazines were in great demand—so much so that we were able to refuse credit to newsdealers for the return of any unsold copies. Ah, that Rider Haggard novel! Our grubby little office had been replaced by the entire top floor of our own new skyscraper, and we even had a fireproof vault in which to store valuable manuscripts, drawings and records. Karl Harriman had been replaced as editor-in-chief by Ray Long, and Ray had turned over the buying for Bluebook to me. The Rider Haggard novel came in from a literary agent—a fine robust Alan Quatermain story, copied in that peculiar tiny type-face Haggard affected. I was proud and delighted to buy it, and placed the precious manuscript tenderly in our new fireproof vault, along with scripts by Clarence Herbert New and others. A day or two later I came home from a walk one evening to be met with an urgent telephone message: the office cleaning woman had detected smoke coming out from under the door of the vault; the fire department had been summoned; and I, as the only available person having the combination to the vault (Ray Long was in New York) was to come downtown at once if not sooner. It took me a half hour to get there, however; the firemen naturally had been disinclined to let the fire, if any, burn farther; and they had gone through the wall of the vault with pickaxes. They had found that a handful of smoldering oily rags used to clean a typewriter had ignited a few adjacent papers, and easily extinguished the menace—caused, in their opinion, by spontaneous combustion of the oily rags in that airless place. But the sight that met my anxious eyes was appalling—the floor of the vault knee deep in broken concrete mixed with damp and charred cards and papers. After a half-hour's desperate pawing through the mess, I found Rider Haggard (it may have been Sir Rider Haggard, for he was knighted about that time) and the other manuscripts intact. Breathing easier, I went out for a cup of coffee, phoned friend wife I'd be home when I got there, went back and worked till four in the morning to sort over the debris and assess the damage. And the damage was really very slight; aside from about a hundred record cards destroyed and some Cory Kilvert water colors scorched around the edges, we'd escaped without harm except for the frayed nerves of our president, our vice-president and myself. The Clarence New manuscript I’ve mentioned was one of an extraordinary series called “Free Lances in Diplomacy’’ which was published almost continuously in Bluebook from 1909 until after New’s death in 1933—constituting over three million words, according to the New York Times the longest novel ever written. His hero was an international adventurer who made a career out of foiling plots of enemy alien conspirators, usually Russians or Germans—indeed, I had a hard time to keep him from declaring fictional war on Germany from 1912 on. The stories were somewhat naive by modem standards, but as the years went on New achieved some variety by introducing his hero’s wife, son and a friend or two as alternate protagonists. Moreover, the author had two special assets: acquaintances in the British Secret Service who apparently tipped him off to impending situations before they came to public knowledge, though because of the time-lag between writing and publication, we in the office were more conscious of this than the public. His second great asset was an adventurous young manhood in many far corners of the world; in 1880, on a voyage around the world in an old clipper ship, he was shipwrecked off the coast of Australia, and in spite of a broken arm, managed to keep afloat for five hours. After his rescue, he rode more than a thousand miles through the Australian bush country, and was wounded when natives attacked a sheep station where he’d camped. Later, after a tiger-hunting trip, his ship caught fire and had to be beached on the coast of Australia. As a result of all this, New’s descriptions of remote places were always accurate. And to the best of my recollection, only twice in all the 25 years did he fail to deliver his manuscript each month; once when his wife died, and once when an ungrateful Russian she-bear in Brooklyn’s Prospect Park Zoo repaid the lump of sugar he had given her every Sunday morning by catching his coat-sleeve in her claw and pulling his arm within reach of her jaws. After the loss of his arm, however, our undaunted author rigged a wire from the shift key of his typewriter to his foot, and continued to type his own stories with one hand. What a grand time New and his “Free Lances’’ would have had with the international set-up today! 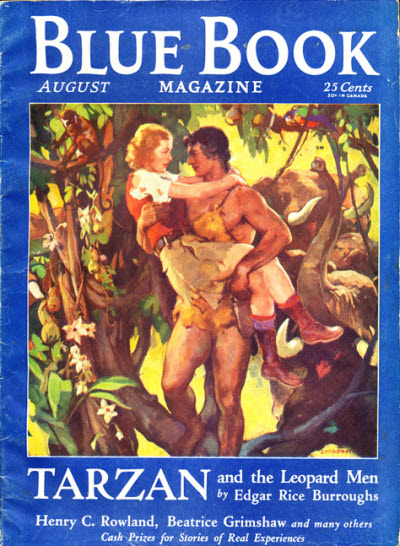 Another popular writer whose work appeared in Bluebook for over 25 years was Edgar Rice Burroughs, whose Tarzan novels were first serialized in Bluebook in 1916 and continued at frequent intervals until 1938. While his stories leaned far more heavily on the imagination than Haggard’s, they both capitalized the fact that much of Africa was then unknown; and in spite of reports from Livingston, Stanley, du Chaillu and others, it was not difficult to achieve the willing suspension of disbelief that enabled a reader to enjoy them. Of late years, of course, largely through the far prowlings of our airplanes, this earth is all too well-known. As late as 1936 I risked a novel based on an imaginary oasis in the Arctic warmed by hot springs—“Hawk of the Wilderness, ’’ by William Chester—but the wonder of the unknown world has indeed all gone now. Indeed, I think this has accounted for the vogue of so-called science fiction: with no place on the earth left for exploration and new-discovered wonders, we have jumped the humdrum track of reality to venture into space beyond the stars. The year after Burrough’s bow in Bluebook, the first World War began; and one copy of our January 1917 issue became internationally famous, for across four pages of “The Yukon Trail, ’’ a novel by William McLeod Raine (he died only a few months ago) one of the German saboteurs responsible for the dreadful Black Tom explosion had written an incriminating message in “invisible” ink. However, it didn’t come to light until years afterward. If it had, we would probably have entered the war sooner, for American tempers were then already close to the boiling point. Sabotage explosion of Black Tom island, New York ammunition depot, helped bring the U. S. into World War I.
Coded message written in a copy of Bluebook incriminated the saboteurs. That first World War had much less impact on the magazine than the second, partly because the need for strict censorship was not so well realized, partly because our involvement in it was over much sooner. Herbert Stoops, who was then drawing heading pictures for us, went to officers’ training camp and then overseas—and sent a few drawings which we used as frontispieces. Robert Casey, Frank R. Adams and some other good contributors were, like Peter Kyne, lost to us for a year or two, so that we were sometimes hard-pressed to find good material. We did, however, have an excellent series of fiction war stories by Edwin Balmer, some war- dog stories by Albert Payson Terhune, and other notable contributions. The increasing importance of motion pictures had by now largely confined popular interest in the theater to New York. The theatrical section in Bluebook had been abandoned for some time, and an attempt to substitute a moving-picture section didn't work out. Green Book was given up as a theatrical magazine; for a time we tried to convert it to a magazine devoted to the interests of professional women, but there were not many career girls then; and in the minor depression of 1921 Green Book gave up the ghost. It was about this time that I had an experience with the plagiarism worry that provided a laugh. A new literary agent set up in business. I'll call him John Smith, though the name he used was much fancier. The group of stories he sent us was surprisingly good, but one of them rang a bell in my head. After some days of memory-searching I was able to run down that story—a copy, word for word except the title, of a story that had appeared in the old John Brisbane Walker Cosmopolitan. I wrote to “Smith" in protest, and his reply was very apologetic—he was at fault for not looking up the writer more carefully, and so on. From some collateral evidence, however, I was pretty sure that Smith was trying to make a business of this sort of theft, protecting himself under his screen as an agent. Sinclair Lewis was in Chicago that year, and I had luncheon with him at the Cliff Dwellers Club now and then. One day I told him about this agent and he was much interested. “Oh, yes, " he told me, “I had my experience with that fellow. " It seemed that early in his career Lewis had for a time been Associate Editor of Adventure, under the able leadership of Arthur Sullivant Hoffman. They worked in a big room, Hoffman’s desk in one corner, Lewis’ in the other. One day our literary crook had called Lewis up with a bright idea— namely that in returning unavailable manuscripts, Lewis write the author saying that this would be a perfectly salable story if it only had the professional touch, and that one John Smith, of such and such an address, was admirably qualified to supply it for a modest fee—and they would then split the take. Lewis said this made him so furious that he burst out over the phone: “Why, you blankety, blankety so-and-so. " Whereupon Hoffman, not knowing who this was or what it was about, looked up from his desk: “Why—why, don't stop, Lewis. Call him a .... Call him this, and that, and the other thing. " Between them they achieved a really volcanic vocabulary of invective. 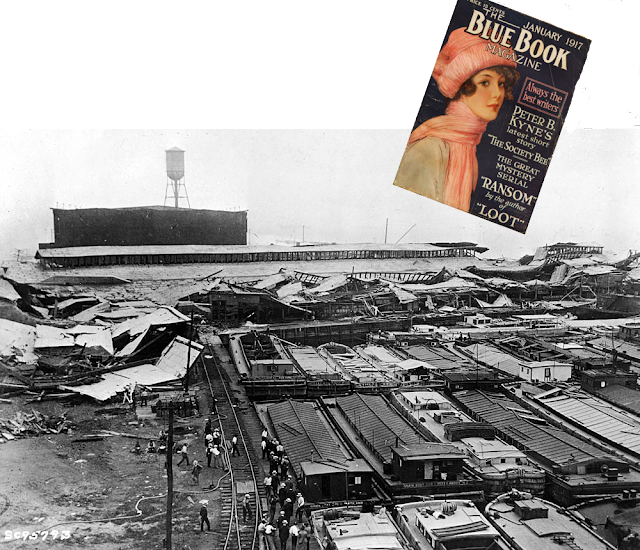 One special source of editorial concern was for many years peculiar to Bluebook: In 1925, sensing a turning of public attention toward stories of fact, we advertised to our readers that we would pay a hundred dollars each for the five best stories of real experience sent in each month—“What was the most exciting event in your life? Tell us about it in 2, 000 words or less." These stories began to come to us in increasing numbers—from soldiers and sailors, from professional adventurers and soldiers of fortune—and of course from professional liars, too. One evening at dinner after I had recounted to my wife one such yarn that had come to me that day, she looked across the table at me with that kindly, appraising smile which good wives employ, and commented: “I caught me a wild boy; now he lives a quiet suburban life, and the wild men come in and tell him about the outside world. " I will digress to explain that the “wild boy" characterization was probably a reference to the 800-mile horseback ride from northwestern Colorado to southwestern New Mexico I had taken with my brother in 1903 in search of the ranch which had been prescribed for him, and to my four years in New Mexico when it was still a Territory developing a couple of claims into a real ranch. It was not really very wild, however; except for a few isolated episodes, the West has not really been wild since the Seventies. Indeed, the experience may have been an editorial handicap to me later, for I found it hard to buy the bang-bang Western stories that still seem to be in favor with some people. One of the proud moments of my life occurred when my brother and I rode tired and dusty into Durango, Colorado. I had a little hunting rifle, a Savage 30.30, in a scabbard under my leg—observing which, the town marshal took it away from me and put it in escrow in a saloon. I could have it back when I left town. I was kid enough to be tickled pink to be taken for a tough character; my brother, who was older, was a bit annoyed. But the episode gives you the picture; at that time, at least, you would not carry a gun in any Western town; it wasn’t manners, and it wasn’t permitted. Since then, of course, the cowboys have been to the movies, and some Western towns are not insensitive to the tourist appeal of a little Wild West decor. Hunters and fishermen also sent in a good many stories, but most of them were routine and better suited to the audience of a sports magazine. A few were special, however. Sascha Siemel sent us in 1934 what was probably his first account of hunting and killing a jaguar with a spear. Another odd one was Jack Abernathy, a Texan who had developed a technique of running down wolves on horseback, and capturing the beasts alive seizing them by the jaw, back of the teeth, with his hand. A photograph sent in corroboration showed his friend Theodore Roosevelt standing by while he held up a captured wolf by the jaw. Another weird one was from a man who, driving a truck on a jungle road, encountered a gigantic python. The huge reptile showed fight; he undertook to run it down with the truck, and a terrific battle ensued until, after some 20 desperate passes, the truck finally won. This interest in wild animals, which I think many men share, led us also to take on a number of narratives from circus animal trainers. Keeping in mind the old saying, “It is a portion of probability that many improbable things will happen,” we sometimes printed stories that in their naked outline seem rather tall, but which had a quality of sincerity in narration that made them sound credible. A case in point was the story of a man training for the balloon service in England during the first World War. With two or three companions, he was aboard a captive balloon when it broke loose and went scudding across country. Not very high, they dropped overboard the “trail rope” used in making landings, in the hope that it would catch on something. It did—on a “goods train” chugging northward. Towed thus for a long distance, they were terrified anew to see the engine ahead of them disappear into a tunnel. However, nothing happened, for the rope broke when it hit the arch of the tunnel, and shortly afterward they grounded safely and disembarked—after reviving one of the men who had fainted from the reaction. Sounds like a thundering movie thriller, but because of the simple sincerity and lack of dramatics in the telling, I believed it; and so far as I know, the readers did too. These stories of real experience kept coming in —from the Rangers and Forest Service men, from war correspondents and city newspaper men, from policemen and doctors and lawyers, miners and farmers and factory workers—all sorts and conditions of men who might or might not be expected to live dangerously. Some of these contributors, like Leland Jamieson, began a successful writing man’s career in this way. And there were some already noted names among them. General Smedley Butler of the Marines gave us several exciting episodes from his adventurous career. Admiral Byrd contributed a splendid piece on his Antarctic exploration. And four of the Arctic explorers— Stefansson, Sir Hubert Wilkins, Burt McConnell and Matt Henson (who accompanied Perry to the Arctic) each contributed one or more stories. Later we expanded this idea to include a number of much longer autobiographies which had to be published serially. Charles Brower, who for 50 years ran a whaling station and trading post at Point Barrow, the northernmost spot in Alaska, gave us his life story, “The Land of the Long Night. ” He was then the only living man who had hunted the great bowhead whale while with the Eskimos, using their primitive weapons and techniques, and his record forms a real contribution to history and anthropology. Captain Dixon, a Canadian skipper who had sailed the Seven Seas for 35 years, gave us ‘‘A Million Miles in Sail. ” He wrote in what might be called a “debunking” mood. He had crossed the equator 35 times on the Atlantic and 16 times on the Pacific, and had kept records for the British Meteorological office. The highest temperature he had ever recorded at sea on the equator was 80 degrees; the highest anywhere at sea was 86 degrees, north of Borneo! In 1927 Edwin Balmer came on the job as editor of Red Book. The relationship between the two magazines continued close for some years after that, and I did some work for Red Book as its associate editor until 1944 or so; but after 1927 I was allowed to paddle my own canoe with Bluebook, and no longer had to absorb an occasional reject from the Red Book inventory. Then in July 1929 came a big change: the McCall Corporation bought Red Book and Bluebook from the Chicago owners, and Mr. Balmer and I, with one or two others, were moved to New York along with the magazines. We now had our own printing and engraving plants instead of having to work with outside people. And the fact that most of the literary agents, book-publishers and illustrators were located in New York was an added advantage. In 1930 we carried out a long-cherished plan to enlarge the magazine to its present size, but in doing it I worked myself into a serious illness that sent me to the hospital and kept me away from the office for four months; then when the Depression caught up with us, it seemed best to reef our sails before the storm, and in 1932 we cut our price to 15 cents and went back to the old smaller size. The next year Bluebook profited by something very special in what has come to be known as science fiction. Edwin Balmer and Philip Wylie in collaboration contributed a novel that still after 20 years enjoys a book sale—“When Worlds Collide. ” A year or two later they followed it with a sequel, “After Worlds Collide,” and within the last few years these have enjoyed a good run as a Technicolor movie. The vogue for this sort of thing seemed to increase with the years, and we continued to offer fiction of this very special type in nearly every issue, much of it by the inimitable Nelson Bond, and some by Robert Heinlein and others. In September of 1941 the magazine was enlarged to its present format, and the change seemed to attract readers, for circulation climbed at once. The increasing specialization in magazines as well as in other aspects of American life led us to label Bluebook as a man’s magazine, though I have reason to believe it still attracted a share of women readers. Perhaps unwisely, I did not extend this specialization to an editorial staff, but continued to run a one-man show and do my own art editing, for I had quite an acquaintance among illustrators, and felt that there were compensations for whatever shortcomings my lack of technical training as an artist might cause. For I thus retained a viewpoint closer to that of the reader; and each item in the book was a unified projection of an idea. Indeed, I was sometimes influenced in the decision on a manuscript by the knowledge that it would, or would not, give a particular artist a good opportunity.... Moreover, a great loss in my personal life urged and enabled me to devote my whole life and thought to the magazine. Came the Second World War, and with it new problems, for with 12 or 14 million men in the service, our sources of material were curtailed. We discontinued serials, for although we got out an overseas edition for the armed forces, it was necessarily reduced in size and content, and many readers were moved about so frequently and suddenly that we couldn’t expect them to follow one story from month to month. We likewise discontinued the Real Experience department, for the terrific events overseas made peacetime adventures seem tame and pallid, and censorship forbade printing much timely material about the war as it was being fought. A dramatic cover from World War 2 days. A special edition went out to servicemen overseas. For the most part our relations with the censors were good. Only once did I receive a call- down—this because of something in a fiction story about an episode off the Canadian coast. When I sent a photostat of the Canadian censor’s okay, they changed their attitude, but apparently they took it up with the Canadian censor, for he asked to see the script again, then returned it with thanks but no comment, so I never did learn what the shooting was about. We were supposed to censor our own fiction, but now and then I asked for a visa on some fiction story dealing with a tender subject. A novel with most of its scenes laid aboard an aircraft carrier went to the censor for this reason, and he saved me embarrassment by pointing out that the author had erred in having the commander of the carrier make a flight—his duty, as I should myself have realized, is to his ship, and (on the record, at least) he stays on her except in port. The difficulty was easily fixed by changing the job of that particular character. Another encounter with the censors is of rather special interest. In May, 1945, Phil Wylie’s agent sent me a novelette based on an imaginary German attack on us with an atom bomb in 1960. I didn’t know for certain that we were ourselves readying an atom bomb, but we had received a directive telling us to avoid mention of heavy water and certain other items, that enabled me to have some idea of what was in the offing. I sent it at once to our censors, who returned it with a long letter explaining that because every fact in the story had in one form or another been printed before, they could not forbid its publication, but they would be a lot happier if we didn’t print it, because they thought it so good that it was likely to start a wave of such stories, and sooner or later someone would disclose something important. There was only one answer to that, of course, but next day an official appeared asking for the addresses of Wylie and his agent— presumably to make sure the story was not offered elsewhere.... Months later, the afternoon of the day that President Truman announced the bombing of Hiroshima, the censor wrote me to clear Wylie’s story, and I got it into the first issue I could, October. So far as I could learn, it caused no special stir—I suppose because it seemed something of an anticlimax after the tremendous fact. With the war over at last, the now-it-can-be- told idea was for a time dominant. Richard Kelly, a Navy officer who had served with O. S. S. and had access to some of the records, contributed a dozen or so accounts of O. S. S. exploits that elicited a letter of praise from its commander, General Donovan. For sheer cold two-o’clock-in-the-morning courage, these lone nighttime parachute drops behind the enemy lines were remarkable. Another fine now-it-can- be-told series was made up of 15 records of submarine patrols in enemy waters, some contributed by Admiral Christie and others, but the majority by Commander Beach—now the President’s naval aide. Admiral Oldendorf gave us “Big Gun Fleet, ” the story of the Suriago Strait battle, probably the last naval action to be decided by gunfire; and we had sundry other Navy records, including a very interesting series about the hazardous jobs of the underwater demolition teams in the Pacific, by Edgar Higgins with Dean Phillips. With no wish to slight the Army, we found it not easy to report their great effort, for the operations were on so vast a scale, with so many units integrated, that an individual impression was difficult to convey. We did, however, have a story of the Bulge action by Colonel Dupuy of General Eisenhower’s staff. Colonel Graves of the 517th Airborne, gave us the story of his outfit, and because it was a separate regiment not attached to any division, this record made a unit in itself and could be published as such. Robert Bliss in “Close Combat” projected the infantry battle picture from a private’s viewpoint, and Captain John Beach from that of a line officer. And even before the end of the war, we had a number of picture spreads of the air war from our artist Hamilton Greene. Perhaps the most remarkable of our fact war stories, “The Autobiography of a Kamikaze Pilot,” came to us only in 1951, when Richard Neville, son of an American consul stationed in Japan years before, brought in his boyhood playmate Yukihiza Suzuki. As an American Air Force officer, Neville had helped bomb Tokyo; Suzuki had been trained as a Kamikaze pilot in the Japanese air force, but we had dropped the atom bomb before it came his turn to commit suicide. Suzuki was in 1951 studying at the University of Michigan (and majoring in American history! ) and had written a very long account of his Kamikaze training, out of which we were able with some difficulty to cut three articles that shed real illumination on this fantastic, dedicated and dangerous threat to our ships. One short wartime fiction story by Fred Schiller won special prominence. The scene of this story, “Ten Men and a Prayer,” was Cassino, that bitter battle in the vicinity of an Italian monastery. A Jewish boy had been killed, and comrades of his faith wished to give him an orthodox funeral. For one ritual prayer in this service 10 persons are required, but there were only nine Jews remaining in the outfit, and to solve the difficulty, they set up a statue of Christ which had been knocked down in the monastery as the tenth Jew. I bought and printed the story because I thought it packed a wallop, but was surprised as well as pleased to learn that it had won second prize in a contest sponsored by the Bureau of Intercultural relations for the best magazine stories calculated to promote good interfaith relations. The first prize went to the novel “Gentleman's Agreement," by Laura Hobson, serialized in Cosmopolitan. Canada gave us a postwar headache by a regulation forbidding the importation of magazines containing more than 50% fiction. Most of the better American magazines were not affected by this, as advertisements were counted in reckoning the non-fiction content. Bluebook, however, with no advertising, was on the spot, for we ran about 25% articles and 75% fiction. Reluctant to lose our Canadian friends, I put all our articles in the front of the book, had a portion of the first 96 pages bound separately and offered at a reduced price in Canada. Many Canadian readers wrote in protest, but enough bought the smaller book to justify the move. I and most Canadian readers, however, were very glad when their government relented, and we were again able to offer the complete magazine north of the border. Came the Korean War, and Major Simmons of the Marines, who had taken part in the Inchon landing and the subsequent difficult retreat in the north, sent us some vivid stories of this bitter warfare—in which he himself won a Silver Star and a Purple Heart. The Marine Corps censor in Washington was rather tough with these, but even as pruned they were very good. Once this censor caused me some perplexity by cutting out the identity of Simmons' battalion, but leaving in references to Sergeant Lee of Item Company, Sergeant Turner of George Company, and so on. Eheu fugaces! Perhaps after all it was a happy profession. For oft on a stilly Berkshire night, I sigh through my long white beard, and long for the light of other days.... Selah. I have this issue and it's been a long time since I first read this excellent article. 42 years with one magazine must be some type of record. In 1954 the magazine began a decline, one of the first signs being the saddle stitched format and the increased reliance on fact articles. Of course my preference is for more fiction but this issue shows six articles and six fiction stories. The articles include such mundane subjects as hunting accidents, how to save thousands on a new home, car accident deaths, tips on building your own boat, and TV soap operas. Another sign of decline, and since both Sai and I collect original art, a very depressing sign, was the mediocre artwork in this issue. 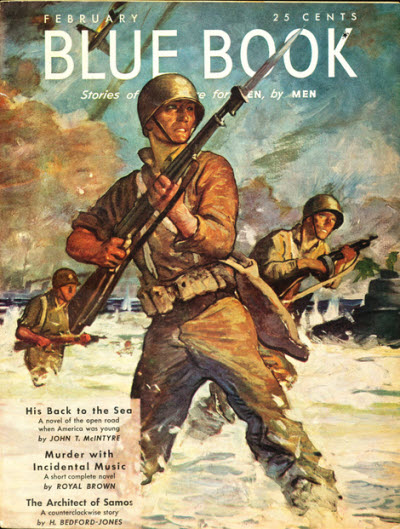 At one time BLUEBOOK was the best illustrated pulp. Soon the magazine would be just another men's adventure magazine. A sorry end for a great fiction title. I also recommend Mike Ashley's excellent 20,000 word article on the history of BLUEBOOK. It's available in Doug Ellis' great fanzine, PULP VAULT 14, the greatest issue ever of a pulp fanzine. Black Dog Books and amazon.com have copies available. I suppose you mean 1952, which was when Blue Book the pulp became Bluebook the men's magazine. The Feb 1952 issue, which was the first after the transition, actually featured art by Stan Drake but let go of all the amazing artists from earlier. That was a bad decision, because the bedsheet sized issues in the 1940s and early 1950s are filled with great illustretions and stories. I'll review an issue sometime. Later issues were filled with less distinguished illustrators and authors, and the magazine came to an end in May 1956. The name was later resurrected for another men's magazine, which is best forgotten.